Blue Murder: three examples of Ebay auctions needing a little detective work. That is what it said in the auction description, and every word and letter is true. At face value this is offered as an original pressing – it is mono, and has the original 47W63rd labels. But there is a lot more information required and some is available in words and pictures accompanying the bald headline. The Inner Sleeve is wrong. 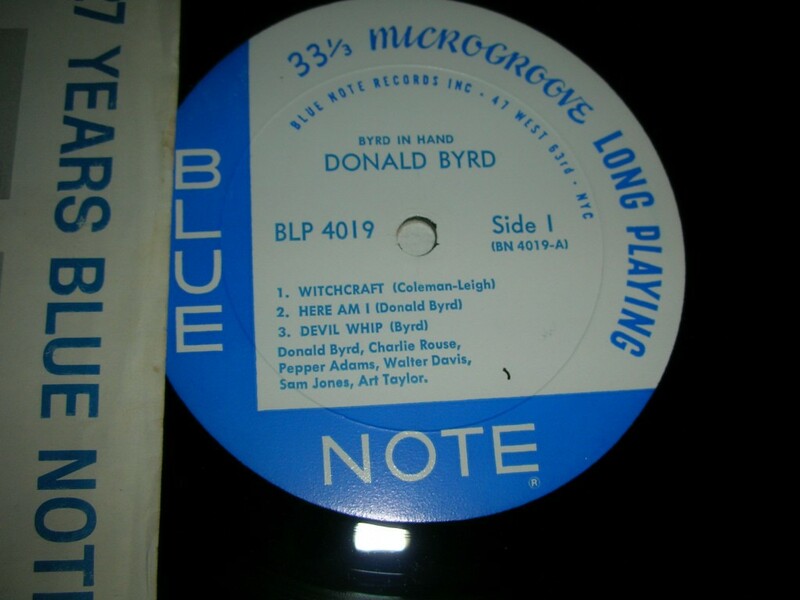 The inner sleeve “27 Years of” dates from 1966, the last year of Blue Note Inc. Byrd in Hand was recorded in 1959 and released 1960, six years before this inner sleeve came into use. Inner sleeves can get mixed up, the inner sleeve is only circumstantial, but no original pressing has an inner sleeve from six years later. That alone should start alarm bells ringing. Not Deep Groove. The original first press from 1960 below on the right, is deep groove. The groove on the label shown on the left is a shallow single step not a deep groove. The width of the groove just brushes the top of the letter “O” in NOTE. The deep groove on the right is the entire thickness of the stroke of the letter “O”. It can only be a later pressing. No reference in headline description to the die-impression: Deep Groove or not? One reason to make no mention of it is if you know it is not DG, when the original pressing would be. The general principle on eBay is that sellers must describe what is there, not what is not. “Deception by omission” is within the rules. No mention as to the presence of the Plastylite “Ear” . The ear will be present on the 1st pressing, also present on subsequent pressings made before 1966, but absent from pressings by Liberty after 1966. (The only known exception is BLP 1595, known to have had additional copies pressed for Blue Note by Abbey Mfg) No mention of the ear”, from a seller smart enough to abbreviate the label address to W63R, is a strong indication that it is not present, and therefore that the record was pressed after the sale of Blue Note to Liberty. But those “original” 47W63rd labels? 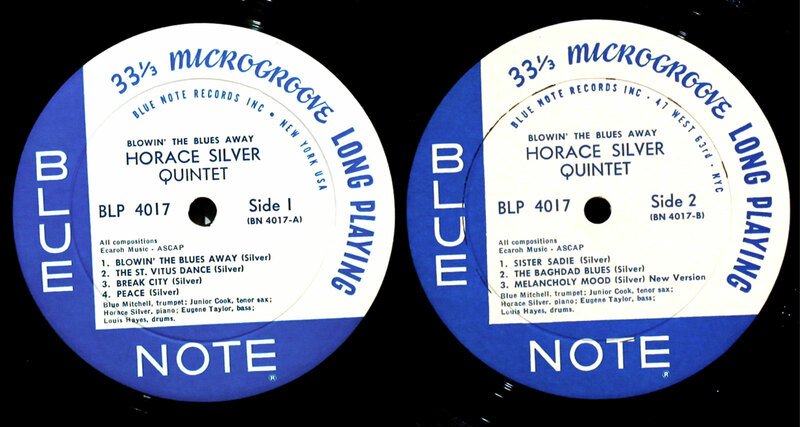 Blue Note had labels printed in batches, held in stock, and used for further pressing runs of that record if it sold well. Only when labels stocks were used up would more be printed, with whatever corporate address was then current at the time. 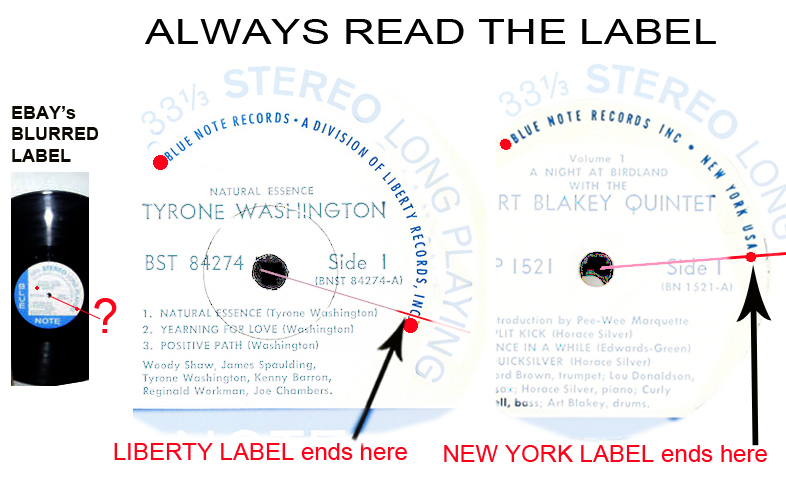 Liberty acquired not only the Blue Note recordings, but also physical assets like stocks of labels, including some batches of old labels going as far back as Lexington for some titles, as well as those printed in preparation of future releases. The final buyer paid $221, around three times its market worth. The consolation – Liberty pressings in their first and second year are a good match for Plastylite, and sound pretty much as good. They generally have less wear and tear, as record player cartridge and tonearms became lighter and less destructive of vinyl later in the ’60s. However they are not as collectible, lacking the cachet of original Blue Note. The seller made no false claim, just provided enough dots for an unwary buyer to connect them – wrongly. The jury find the seller not guilty on all charges. We find the buyer guilty of bidding without due care and attention, naivety, over-optimism, and failing to do their homework. However this is all within the buyers rights. The jury recommend no further action against the buyer as he has paid enough already. It is standard practice in this litigious world to advise “Always read the label”. With Blue Notes, however, you should always read both labels. Just because it says “Lexington” on Side One doesn’t mean it can’t say “New York” on Side Two. Just because there is no “R” on one side doesn’t mean there isn’t an “R” on the other side. Modern manufacturing consistency doesn’t apply to the operational realities of the Fifties record pressing plant. This record was described as a 47 WEST 63rd. Which it was, on Side Two. Unfortunately, Side One bore a later New York label. So despite being Deep Groove on both sides, a surefire sign of a first pressing you might think, it turned out to be a second or third pressing, with the Plastylite pressing plant using up old stock labels. The deep groove can be a contra-indication. Prior to 1961 all pressings were deep groove, both sides. 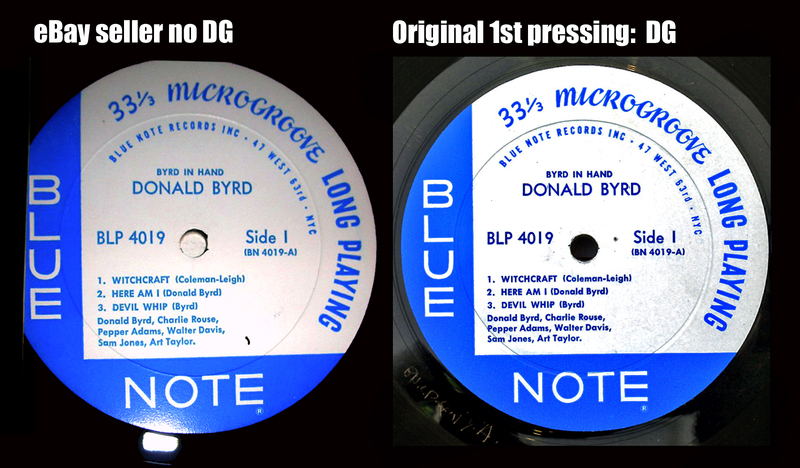 New Blue Note releases after 1962 generally have no deep groove, as the DG dies had become obsolete and replaced with newer dies that left the simple single-step impression. However during the transition, both old and new dies were used in a seemingly random fashion. Some 1st pressings are known to be DG Side 1 only or Side 2 only, but never both or neither side. Though bid for as an original first press, it turned out quite differently. The anomaly came as a surprise to the seller, who had “seen what he expected to see”. A price adjustment was agreed. What is it about “assumptions”? Assumptions are a big time-saver, we make them all the time. Life probably would seize up if we evidence-checked every thing, but I still remember, with horror, the time I was in an important job interview. Things were going pretty well until I looked down and discovered to my horror I was wearing socks of an unmatched pair. “Is this the kind of man we want leading our Department? Someone who can’t even make socks match?” It never occurred to me to check. So trainee vinyl sleuths. Today we learned some important lessons. Assumptions are your enemy. No shortcuts, no time-saving, trust no-one. Check everything. Ebay sellers are not all experts on selling records, however they are selling and you are buying, and if they have what you want, you are going to have to do some guesswork. You could of course ask the seller questions, but that will alert all other potential buyers. Sometimes the lack of information is frustrating, but when it is coupled with a blurred photo of your desired object, figuring out what to offer can be difficult. I recall emailing one seller if the record had the ear. The reply came back:”What’s an ear? What am I looking for?” Another one claimed not to know what the runout or deadwax was. It’s not necessary to read the address, it is the clock-position that the address ends at which tells all. Coming up to three o’clock is New York, around four o’clock is Liberty. You guys are awesome!! Thank you for all the info. If you have time, I have another question about a recent purchase I made. I picked up a mono copy of Jackie McLean’s “Let freedom ring” and it also only has DG on one side…would this be a first pressing? I would be reluctant to deal with this seller because of overgrading. He has got 11 negative feedbacks in one year. Thank you for responding. Is it a 1st pressing? I have no competence to reply to that question. More qualified colleagues on this site will certainly volunteer. Otherwise, consult Fred Cohen’s book on Blue Note which will give the answer. No, the original wouldn’t have the “INC” on either side, this first appeared on BLP 4017.
as Aaron notes above – original released May 1958, so INC and ® on label rule it out as 1st press, What it is can be deduced from other clues. The original would have a blank white paper inner sleeve. This has a “no-years” corporate inner which is associated with period 1961 to 1964. 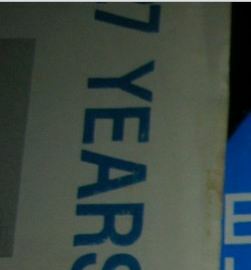 A pity the seller didn’t picture the complete inner, which would fix the date of manufacture more closely. Being DG on only one side also confirms manufacture between 1961 and 1964, when one-side DG is commonly found, not before or after. This is a terrific recording, and though not a 1st pressing, I think it’s pretty desirable as original Blue Note vinyl, and should sound great. However, Rudolf’s note of caution is the key. The seller has run up negative feedback for not replying to emails, not issuing refunds. He seems to have a cavalier attitude to business, which makes it a risky transaction if things go wrong, like grading, which we all know they sometimes do. Calling Detective LJC from across the pond – I recently won an EBAy auction for 6 Pieces…I’m concerned it’s not deep groove as advertised. I don’t think it would be a huge loss even so but could I email you the item # just to see if you could take a look? I’d certainly appreciate it! All fine, except there are collectors who want the anomalies like different labels each side, deep groove one side only. I have sold these described down to the every detail, and had offers of $400 that I have accepted more than once. The full on collectors want the variants as well! Amazing. It must be like those guys that collect every possible variation of the same Beatles record. I read somewhere of a guy who had 139 variations of just one LP. Its back to the psychology of collecting, probably as many different reasons for collecting as there are collectors, though sometimes I wonder if professional help wouldn’t work out cheaper.